title=”Payslip Format in Word Free Download” href=”https://semioffice.com/slips/salary-slips/payslip-format-in-word-free-download/”>earnings when ever you work on hourly basis or you spend over time in the company. You also use this time sheet if you are working for alternate hours. 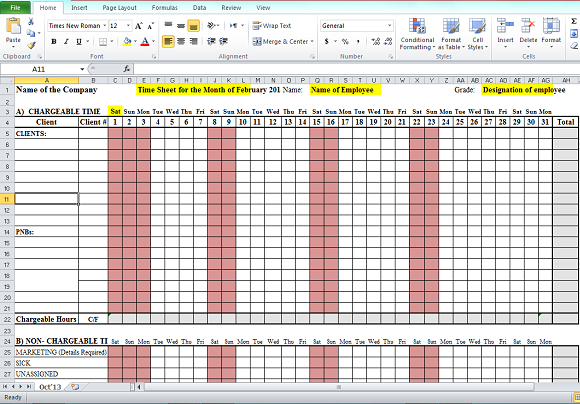 Sample Timesheet Format in Excel Free Download for office, school, shop, company or business. This time sheet template include chargeable hours and non chargeable hours to clients or employers. Time-sheet is used for calculations of hour based working to charge hourly rate from clients or customers. The original file is available in excel for free download with many options like working on holiday or working for alternate hours of sick leave, casual leave, annual leave etc. Please download the time sheet file. Fill all the sections with your company information and put values in the calculation sections. The time sheet is fully automatic so avoid to delete any cells with or without formulas.